I've painted a few watercolor paintings. I always end up being satisfied with my paintings but I can't begin to say how hard they are for me to do. I see what I want in my head, getting it down on paper is quite another thing. I feel like I'm counterfeiting. It is really quite the struggle. Knowing that, I told myself I would never try to draw a face. Never! Well never is a long time and things change. For the last week I haven't been able to get downstairs to my studio. Boredom and frustration overtook me. I grabbed a regular pencil and a pad of paper and just started drawing a face. I was sure that it would be quite the laugh for my husband and me when he got home from work that night. It didn't turn out that way. I picked up the pencil and the face just started pouring out of it and onto the paper. I'm keeping that pencil. I'm sure that it's magic, for I have no clue where that face came from...it had to be in that pencil. This is a scan of my face. It is not nearly that dark in person. 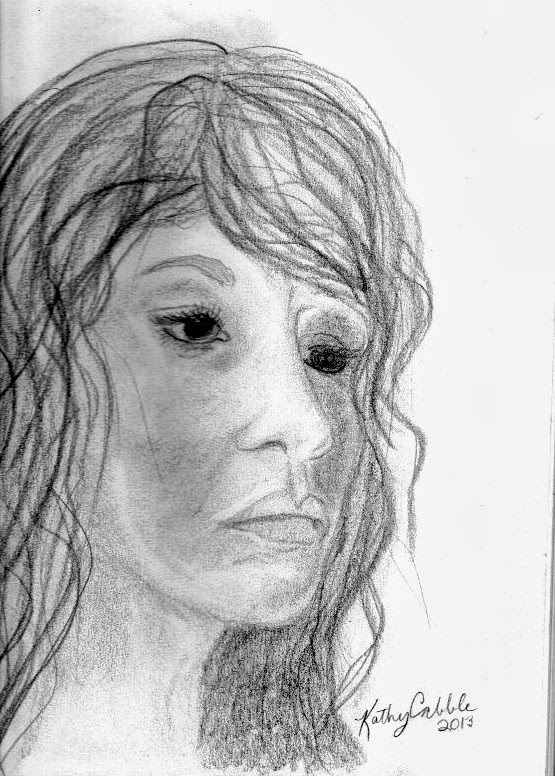 I never dreamed that it would be so hard to get a good scan of a pencil sketch. I even tried taking a picture of it with my camera. I never could photograph or scan any of my paintings. I guess that I shouldn't be surprised. I guess all things said I should just be happy that the scan came out at all. A wonderful face. Keep drawing! I absolutely love this pencil sketch. Jan C.
Thanks to all of you for your compliments. They do inspire me.